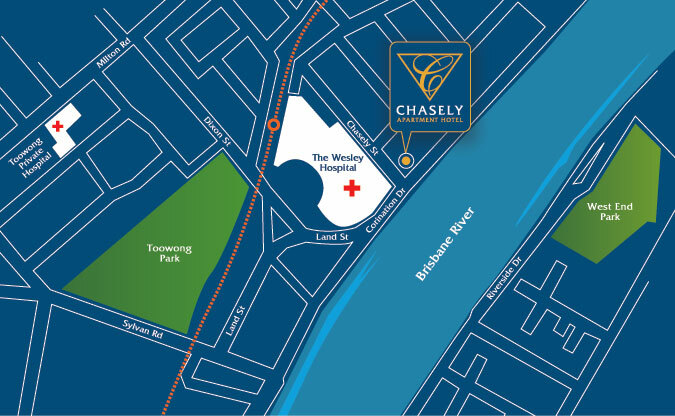 Chasely Apartment Hotel is located a short distance from Brisbane CBD – see how close by visiting us on Google Maps. Chasely Apartment Hotel is so close to everything. Chasely Apartment Hotel is on the corner of Coronation Drive and Chasely Street. Opposite the Wesley Hospital, overlooking the Brisbane River. From Coronation Drive, turn into Chasely Street then 1st Right into Under-building FREE Car Parking - Reception is in the Centre. Please take note that overheight vehicles are to use the Upper Car Park via outside ramp. Chasely has Brisbane City Buses stopping at the front door; Queensland Railways Auchenflower Station at the other end of Chasely Street; the Brisbane River City Cat Terminal is just a short walk along the river; Brisbane Domestic and International Airports are a 20 minute Taxi Cab ride and Yellow Taxi Cabs have a Free-call Hot-Line in the Chasely Foyer. Coach Trans to and from the Airport can be booked at Reception office. Ride the Brisbane River City Cats to see Brisbane from our River.